Bovada Casino Review - Is Bovada Legal For US Players? There are some online casinos that players simply have to check out through the power of a great reputation. The Bovada casino is one of them. This gambling site lets users play for real money through a variety of games, but the games offered at Bovada are only the tip of the iceberg. The overall experience at Bovada is second-to-none, and it starts from the time an account is created. There are several factors that play critical roles to a positive online casino experience. Our sincere hope is that players can learn the ropes around the Bovada casino in the detailed review on this page. 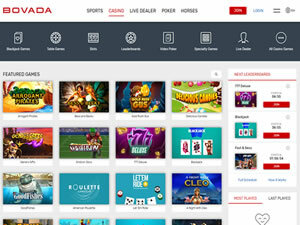 Throughout, discover what makes Bovada better than its competitors, and why this online casino comes with such high ratings. This page will cover cash bonuses, how to play for money, getting your payouts and much, much more. Players in 46 of the 50 U.S. states are eligible to sign up with Bovada. The four states excluded are New Jersey, Delaware, Nevada, and Maryland. If you live in one of these five states checkout these other legal USA casinos. Eligible players can begin the process on-site. New players will be required to answer basic personal questions such as players name, age, and address. During the signup, a login is created that is unique to the user. Overall, signing up at the Bovada casino should take less than five minutes. There are several ways to deposit cash into a new or existing account. The option that account holders use most often is a Visa card. This includes credit card, debit card, and prepaid gift card, any card with a Visa-brand on it will likely be accepted as long as foreign transactions are allowed on the card. Should any problems arise, consult the cashier. Visa deposits are instant, giving the players the chance to put money in-play immediately. Outside of a Visa deposit, players can fund with a 'rapid transfer'. This is through a Western Union or MoneyGram wire transfer. Deposits of this nature take approximately 15-30 minutes before they are deposited. This is because it takes a bit of time for the transfer to be received and then processed into the account. The cash bonus at Bovada for new players is unparalleled. Users have the option to get eight bonuses over their first eight deposits. The bonus covers slots and table games separately. Each section gives players four chances to earn bonus money. For slots, the bonus code SLOTS500 gives players a 100% match up to $500 on each deposit for a grand total of up to $2,000. For the other casino games, the bonus code GAMES250 matches four bonuses 100% up to $250 each for a total of up to $1,000. There is no other online casino that gives players eight welcome bonus opportunities. Outside of the new-player bonus, there are other online casino promotions. They include reload bonuses, video poker bonuses, and much more. All games found at Bovada can be previewed before using. This is true with or without an account. Bovada is a well-rounded casino. They cater to players that enjoy table games, slots, specialty games, or all of the above. For players interested, Bovada provides users with a 'Casino Game Guide'. This guide is a complete breakdown of every game offered. Players can select each game individually for a rundown of rules, tips, and how to make a profit playing. There are over 120 games at available Bovada, and users won't find a casino that does this for each game anywhere else. Bovada is the most player-friendly online casino in the industry. They want players to understand each game to find out where they are skilled and to become educated in online gambling. Bovada Casino Software - What's Under The Hood? Bovada uses only the best in casino software. Real Time Gaming software provides the virtual experience for users on site, controlling of the entire process and security of the website. RTG occupies the largest piece of the online casino industry pie and is involved in most of the websites users will research. Bovada provides detailed information on-site covering RTG and security for user's accounts. Payouts from Bovada can take place very quickly. In fact, through a wire transfer (Western Union or MoneyGram) a withdrawal can be completed within 12-36 hours, meaning payouts within the course of the same day are possible. With rapid transfer payouts, escalator fees may be attached. However, Bovada allows one free withdrawal per month. Players that abide by this will not have to fork over cash to withdraw their winnings. A check option is a very popular method from Bovada as well. Checks take 5-10 business days for players to receive but are paired with much lower fees. Unfortunately, Visa payouts are not available. Bovada Casino is the best for player support. An online contact form can be filled out and answered within 24 hours. Players also have the option to call the General Support hotline at 1-888-263-0000. Help is available 24/7, 365 from Bovada.